40% OFF Your Next Stress Relieving Session! Here at Elements Massage we are committed to providing the best massage services that we can. That also includes making sure that everyone gets the type of massage therapy they need. Everyone comes in with different ailments, pains, aches, concerns, etc. and how to address those concerns are always different depending on the person. One of the reasons we offer promotions every single month is so people get to try out different therapies or upgrades and see what best helps and relieves their issues. 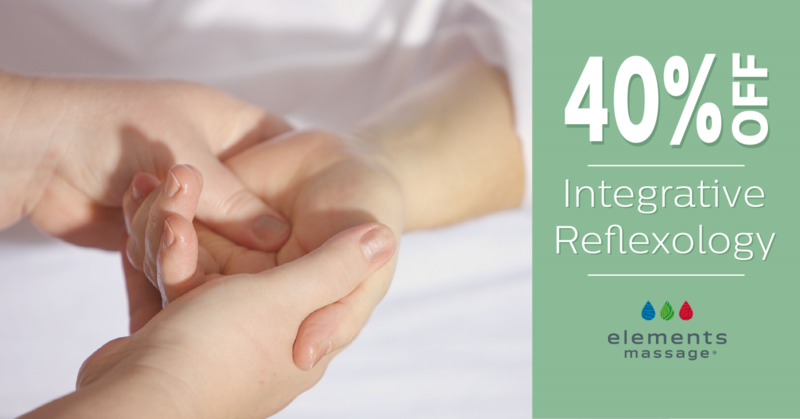 Now, for the month of August, we are offering 40% off all integrative reflexology upgrades. This offer is for both members and non-members to experience and valid for all 1 hour or 90-minute massages for the moth of August. Upgrades will be available to add on in the studio or before hand, for only $15! With all that being said, what is integrative reflexology? Why should you choose this therapy? What benefits does it have? Who would it best suit? All your questions will be answered here! To start, Integrative Reflexology is a massage therapy aimed to be relaxing, therapeutic, and can easy muscular tension and improve circulation. It is different from traditional reflexology, an alternative medicine applied without lotion or oils that focuses on intricate application of pressure points to feet, hands, and ears, with specific finger techniques. Clients who have have already taken part in this upgrade said that integrative reflexology was more enjoyable and comfortable than traditional massages. The techniques were specifically catered to their needs, making it an overall beneficial experience. Integrative reflexology has been found to be the perfect type of massage for a plethora of people. Not only does it leave you calm, relaxed, and rejuvenated, but it can also help address specific concerns you may have with your body. Incoproating this upgrade into your next session is a perfect way to celebrate National Relaxation Day, which will be coming up during the second week of August. It is a time to recenter yourself before school starts up again and summer comes to an end. Take your therapeutic senses to the next level. If you think this is an upgrade for you, feel free to call the Whitefish Bay studio or come in and ask one of our therapists first hand! But trust us, it’s an amazing promotion your body will not regret!